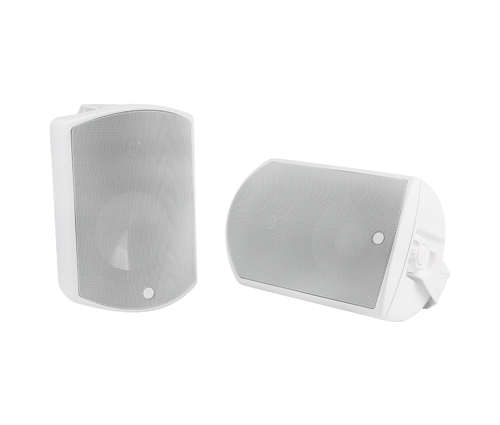 Whether it’s performance or ease-of-install, the Episode Surface Mount Speakers have it all. Their revolutionary, easy-locking bracket makes for quick and hassle-free mounting, while a small form factor allows for discreet placement. And once they’re powered up, you’ll get premium audio across the entire space, thanks to a polypropylene cone and titanium tweeter. Designed to output high-quality audio in any condition, these speakers are the smart solution for your outdoor install. An easy-locking bracket means you no longer have to spend minutes holding a speaker above your head. Just loosen the knobs to separate the speaker from the bracket and then install the bracket where desired. Once the bracket is up, you can lock the speaker into place. Simply adjust the tilt via various notching increments, retighten the knobs, and you’re good to go! For even greater security, remove the end caps and tighten the hidden set screw. With Episode, you’ll never have to worry about sagging. The days of large, bulky box speakers are over. Soft edges help these speakers match modern lighting fixtures, while a compact form factor (30% smaller than our predecessor) allows you to easily hide them under an eave or awning if you so choose. From rain to wind, this speaker can handle it all. A true all-weather product, it features aluminum grills and brackets, a UV-treated, mineral-filled polypropylene cabinet, and stainless steel bolts. Beyond an ability to withstand the elements, this speaker can safely operate in temperatures between -4 and 140 degrees Fahrenheit. Designed for optimal audio quality in wide dispersion audio systems like a porch or patio, this all-weather speaker features top-notch components, including a polypropylene cone with Nomex spider, a high-temperature voice coil, and titanium dome tweeter. Plus, improved speaker sensitivity allows it to play louder at a lower power for increased system efficiency. Easily connect and secure speaker wires with gold-plated push terminals. They’re even hidden behind a waterproof cover for added moisture protection. Without Bracket: 7.5" x 11.1" x 7.2"
With Bracket: 7.5" x 11.1" x 7.7"